The crazy combination Sharwanand and Sai Pallavi in the movie ‘Padi Padi Leche Manasu’ did all the talking with its teaser that is released few days back. Having garnered a fantastic response with over three and half million views for the teaser, the makers have announced the first song launch details. 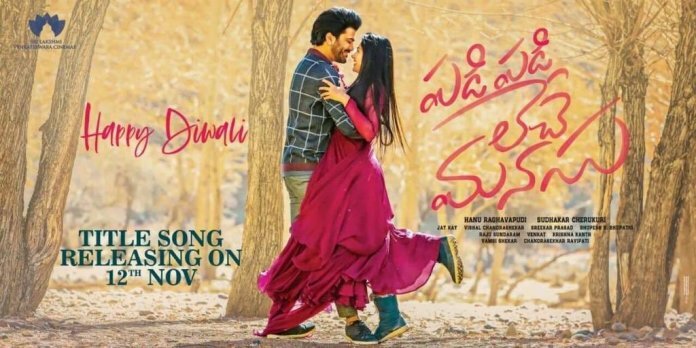 On November 12th, the title song of ‘Padi Padi Leche Manasu’ is going to be released. Vishal Chandrasekhar is the music composer of this romantic entertainer and it is being directed by Hanu Raghavapudi. Shot extensively in Kolkata, Nepal and Hyderabad, the film is nearing a completion. ‘Padi Padi Leche Manasu’ also has Murali Sharma and Sunil in important roles. Produced by Sudhakar Cherukuri under Sri Lakshmi Venkateswara Cinemas banner, the film is releasing on December 21st.